Can we terraform a portion of Mars by enclosing it in a dome? 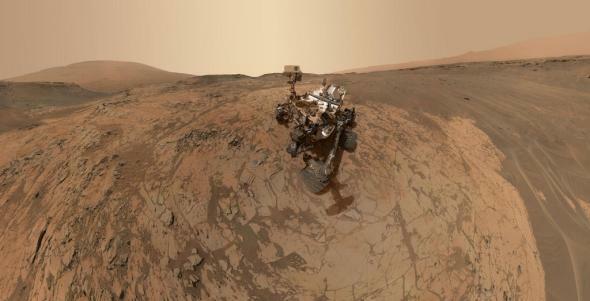 This self-portrait of NASA’s Curiosity Mars rover shows the vehicle at the Mojave site in January 2015. This is sometimes called paraterraforming. Yes, you could cover part of Mars with a dome and then gradually spread that out to cover more and more of it. It might well be more practical than terraforming. For instance, there is a lot of water on Mars—but probably not nearly enough for making an Earth-like planet even if you were to increase the amount of sunlight by using massive mirrors in orbit around Mars or greenhouse gases. Because its polar ice caps are already really tiny compared to Earth. Make it into a terraformed planet and as warm as the Earth and with moist atmosphere, open lakes, etc—well, it would have snow falling at the poles and would need ice caps as big as Earth’s. So it’s not really that practical probably to try to get liquid water on the surface by melting its ice caps. Yes, there is enough to cover Mars to a depth of some meters, but it would all end up falling back at its poles. Also the equatorial regions are probably dry as the Sahara to depths of kilometers. What water vapor there is in the atmosphere, and condensed at the poles got there by sublimation from deep below the surface in equatorial regions, gets into the atmosphere because it is a near vacuum, so even ice well below zero degrees will sublime (like dry ice) and recondense and sublime and condense again on its way toward the surface. Warm it up and make the atmosphere thicker, and what water there is would I think just sink away into the equatorial sands or snow out onto the poles, leaving it as dry as ever. As for making a breathable atmosphere for humans, not much chance of that, as CO2 is poisonous to us. Just 1 percent of CO2 in the atmosphere would kill us. So it’s not possible to make a breathable atmosphere for humans, animals, birds, etc by adding oxygen, even if there is enough CO2 to make an atmosphere dense enough for some plants to grow. And from the evidence so far, it seems highly unlikely that there is anything like enough nitrogen left on Mars for an Earth-like atmosphere with nitrogen as buffer gas. Almost none in its atmosphere and very little by way of nitrates found so far on the surface, so nitrogen particularly is likely to be in very short supply on Mars. But with domes on the surface, you can have shallow engineered pools of water and concentrate what nitrogen you can find into the atmosphere of the habitats. It’s not that hard to make enough oxygen for humans—just a few square meters of green algae, the Russians found, did the trick. There’s a lot more to a habitat than that; for example, ISS has many systems to deal with the waste gases that can build up and the microbes that can build up in a habitat. But it is something much more within our capabilities than terraforming an entire planet. So, yes, this is much more practical than terraforming Mars. But then why paraterraform Mars? Why not create Stanford torus–type habitats in free space instead, using materials from the asteroid belt? Even for Mars, using materials from Deimos and Phobos you could create many Stanford torus–type habitats in orbit around Mars. The problem with paraterraforming Mars is that the life would escape from your habitats—and transform Mars—quite probably not in ways you’d find desirable. How can you reverse it if you don’t like what happens? And you lose the opportunity to study Mars in its current pristine state. Some people think that if you introduce life to a planet then it will automatically make that planet more habitable. So then it makes sense to start by paraterraforming, and hope eventually after a few thousand years the planet itself also gets terraformed. But it might not be like that. Mars for instance started off as habitable as the Earth. Maybe it did have life originally—if so, the life wasn’t able to keep it habitable. It lost nearly all its water that it had originally, and it may still have some life hanging on. It might be that it’s a combination of good location, some luck, and some positive effects of life itself—that is what worked for Earth. Maybe Mars failed because of a not-so-good location, some bad luck, and maybe even life that had adverse feedback effects on Mars instead of the beneficial ones it generally had on Earth. If that’s true, then trying to re-introduce life to Mars, even if it has gone extinct there, may only make things worse. I think we need to understand Mars far better, and also life processes far better, before we can know if it would be a good thing to introduce modern Earth life to Mars, or what type of life would be best to introduce if we do ever do it. And until we know the answers there, the obvious thing is to do your paraterraforming on asteroids, or using material from asteroids to make Stanford torus–type habitats. And in case of Mars use Phobos and Deimos—all the time being careful not to introduce any life to the planet—until we know what the effects would be. Because life introduced to Mars even unintentionally because it leaks from your domes, or indeed as a result of a crash landing of your spacecraft, can never be removed if it starts to reproduce. It could do anything—make poisonous gases like hydrogen sulfide or methane, consume oxygen, have feedback effects that make Mars colder or drier, or in other ways work against what we want to do there. And it might generally mess up the planet before we know what is there. I wish this wasn’t the case. I wish humans could explore planets without causing any problems, as in the science fiction stories. But those are fiction, and in reality, we just don’t have any way to sterilize humans and their habitats to keep planets free of introduced species of Earth life as you explore them—like the rabbits in Australia. While with habitats in free space, not on any planet—or on lifeless bodies with no atmosphere—then if you make a mistake, you can press the reset button and start again. And I expect we will have many mistakes and eco-disasters in the first closed system space habitats until we learn how to do it. We probably need to start small and simple and gradually work up before we can make a full-scale Earth-like habitat in space. After a few decades or centuries, or it might be millennia of space habitats like that, we may learn enough to jump from tens of square-kilometer habitats to planetary-scale eco-engineering of Mars and other planets based on what we learn from the habitat experiments and from exoplanets—but we may find that it is better even to leave them as is. After all there is enough material in the asteroid belt to create habitats with a total area a thousand times the land area of the Earth. We could create a dozen, even a hundred, of Mars analogues in free space. Or we could simulate some interesting exoplanet, as well as many copies of Earth. Why not keep planetary surfaces pristine for now until we understand things better and until our civilization is stable enough and has proved that it can take on multimillennium technological commitments? Space colonization: How feasible is Elon Musk’s idea to establish a colony on Mars in the 2020s? Terraforming: Are there any labs studying “Terraforming” for future use? Space exploration: Why are we thinking about a Mars colony when a Venus colony would be more technically feasible?